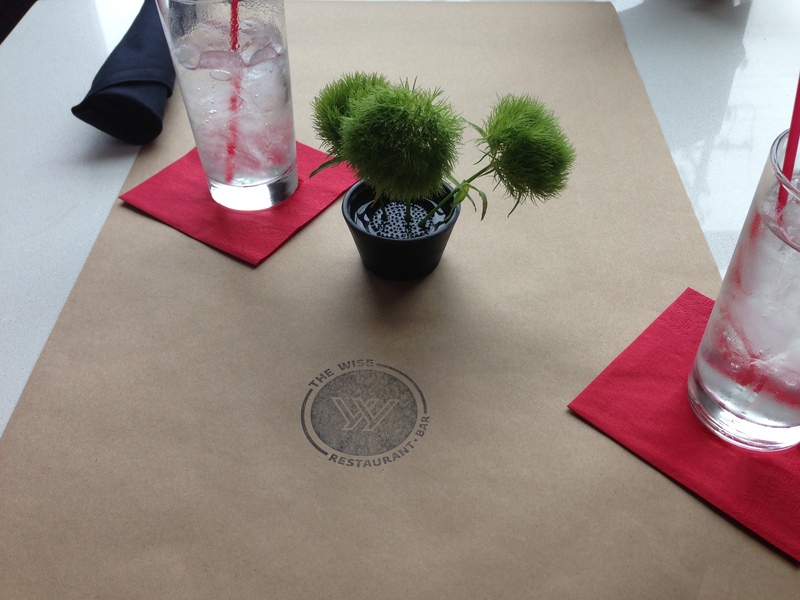 I celebrated the last day of Madison Magazine’s Restaurant Week at The Wise for lunch on Friday. The Wise is in Hotel Red on Monroe/Regent Street. I may be a bit biased because I’m a diehard Badger fan and love my Alma mater’s campus just a little too much but the location of this lunch was perfect. The hotel is situated on a pointed lot so the restaurant was very small but our table was by floor-to-ceiling windows facing Camp Randall. You can’t get a better view than that on Monroe Street, especially when it was 60 degrees in July on Friday! The view on the weather got me really excited about fall football! So needless to say, I was in a pretty good mood before we even got our food. The decor of this place is modern and goes off the of the name with a red, black, white and silver motif. The only thing I didn’t like were the chairs we sat in. They were like living room chairs and they sit way too low for the height of the table. There were three appetizers offered. House-marinaded olives, gazpacho, and a salad with lavender dressing. I’m an avid olive eater (I will eat them right out of the jar standing in my kitchen) and always have been. My Dad has had to ask waitresses to bring olives for me so I don’t eat the ones that come in his bloody marys. I also very much dislike cold soup and lavender so my obvious choice were the olives. The bowl came and was full of a half dozen different types of olives all marinated in a citrusy, lemony brine. The olives were perfectly marinated and the sauce was not too salty. The olives were very unique and enjoyable but the garnish, pickled watermelon rind, overshadowed the olives. It was crisp, vinegary, and flavorful. My mom got the gazpacho, which had a really interesting flavor but neither of us loved it (not because of the quality but probably because neither of us is a fan of cold soup!). Both of the lunches also came with a little dish of uninspired fruit. It was a nice gesture but the fruit’s freshness left something to be desired. For entrees they offered a chicken salad sandwich, pork tacos, and a grilled cheese. The chicken salad had fruit in it (fruit doesn’t belong with anything but itself in my opinion!) and the grilled cheese didn’t sound spectacular. 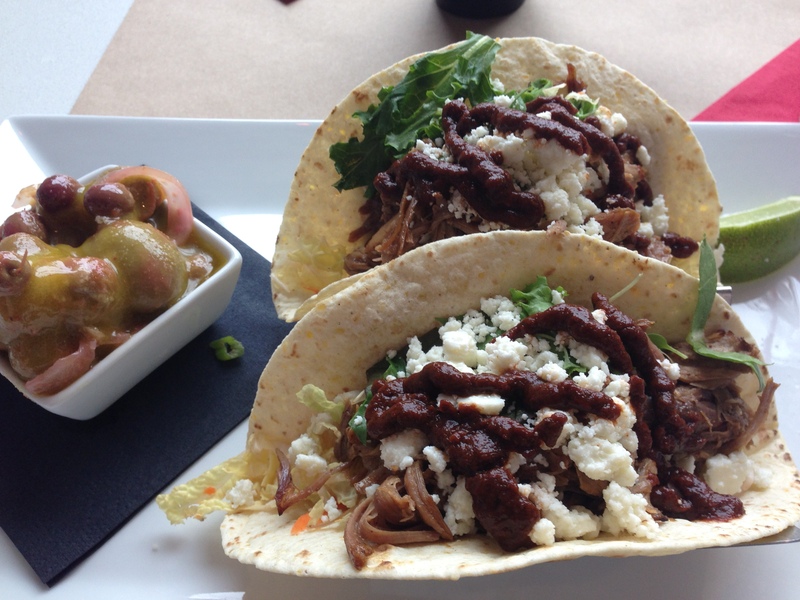 I’ve always wanted to try traditional pork tacos and these sounded pretty close so I got the pork tacos. There were two of them and I’m pretty sure a third of an entire pig was shredded in them. The pork was extremely tender and flavorful, and was accompanied by creamy cheese and an awesome mole sauce. I thoroughly enjoyed them! My mom ate her chicken salad so good I’m assuming she enjoyed it! It came on a crescent roll with celery, red onion and tarragon in it. For dessert they offered a fruit crisp, an olive oil cake with blueberry jam and marscapone cheese, and a chocolate raspberry tart. I got the olive oil cake because I’ve had really good luck with olive oil cakes. 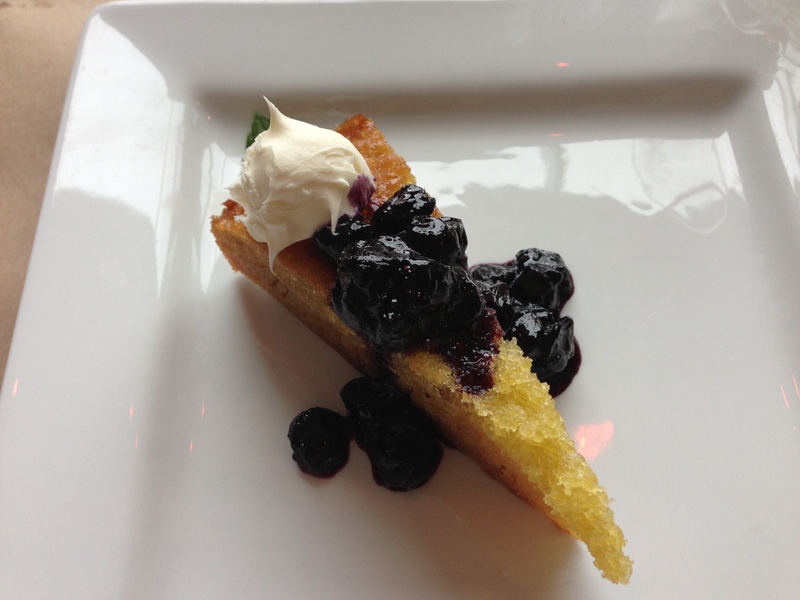 An olive oil cake is like a more flavorful version of pound cake and the Wise’s version did not disappoint. I’m not usually a dessert person but this was my favorite part of the meal. The cake was extremely flavorful, dense and moist. The blueberry jam was not too sweet or gelatinous, which tends to happen with jam. My mom got the chocolate tart and had to take half of it home because it was so rich. I thought the raspberry coulis was too sparse but she liked it (especially the second time around at home with a cup of coffee!). FOODNOTES: This place won me over with its location but I’ll probably be back for the food. It was hit or miss with some of what we ordered but overall I enjoyed my meal. 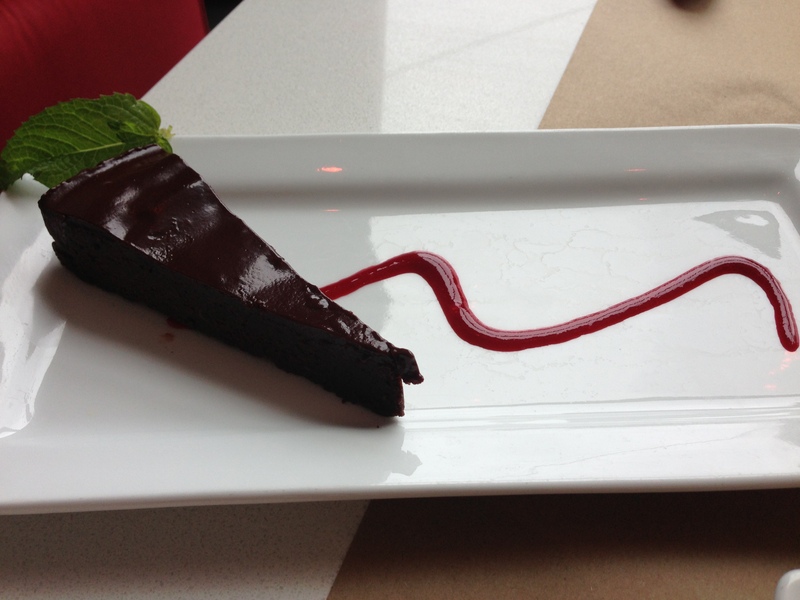 The olives were ambitious and tasty, my tacos had great flavor, and I loved my dessert! I will definitely be taking a look at their regular menu before deciding if I’ll be going back. It’s national wing day. 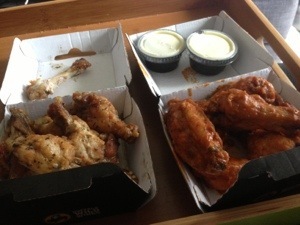 I celebrated with a half order of spicy garlic and Parmesan garlic wings from Buffalo Wild Wings! Those are my go-to sauces with blue cheese dressing and celery! What’s your favorite sauce(s) and condiments? The Pancake Cafe has been a staple in Fitchburg for awhile now and until about a year ago had the most amazing, plate-sized cinnamon rolls. The cinnamon rolls were massive and had the most dense and equally flaky batter (I don’t know how they did it!). The cream cheese frosting was absolutely perfect and I have fond memories of taking one of those behemoths down with friends at work. I went in a couple months ago to get one and the manager told me the baker retired and took her recipe with her so they no longer had them. In my opinion they lost the best thing on their menu with that retirement but I decided to give their new west side location a try because they had cinnamon rolls back on the menu. First of all, the decor in this location is very odd with half-yellow walls, food signs in what I think was french, and big leather couches right when you walk in. It feels like someone’s grandma decorated it and then they put used furniture all over the place. Our waitress, the only one in the place on a Monday morning, was attentive, fast and friendly! Let’s start with the cinnamon roll (I wish I had a picture of it but we ate it before I remembered to take a picture!). They are clearly trying to remake the cinnamon rolls they used to have but it was a little off. First off, it was about a fourth the size, which was disappointing but who needs a cinnamon roll the size of a serving platter anyways! The frosting was almost identical with this one’s frosting being just a bit greasier. The batter was where it really diverted from the original. The batter was lacking in density, flakiness and flavor. It was good, don’t get me wrong, but definitely not the same as the original. I really hope that baker opens a bakery somewhere or lets someone use her recipe! 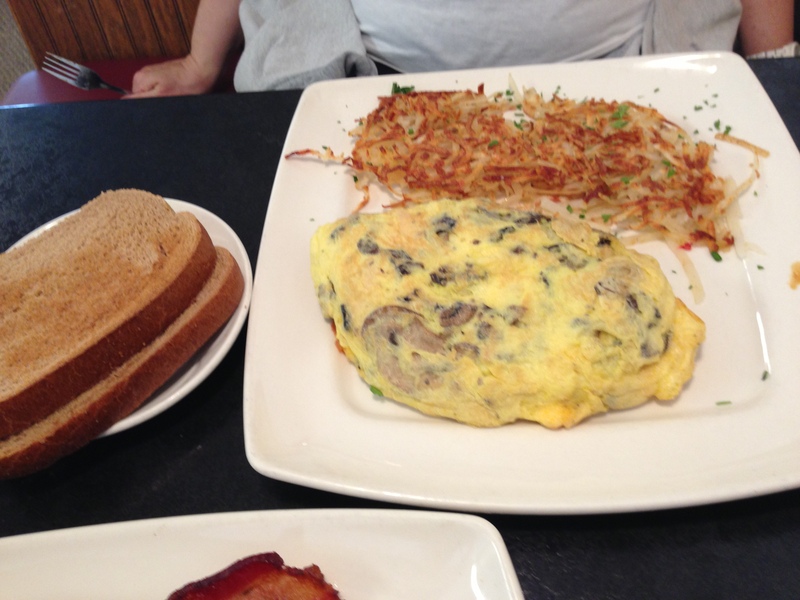 The breakfast menu is exactly identical to the Fitchburg menu with traditional egg, pancake and omelets being offered. 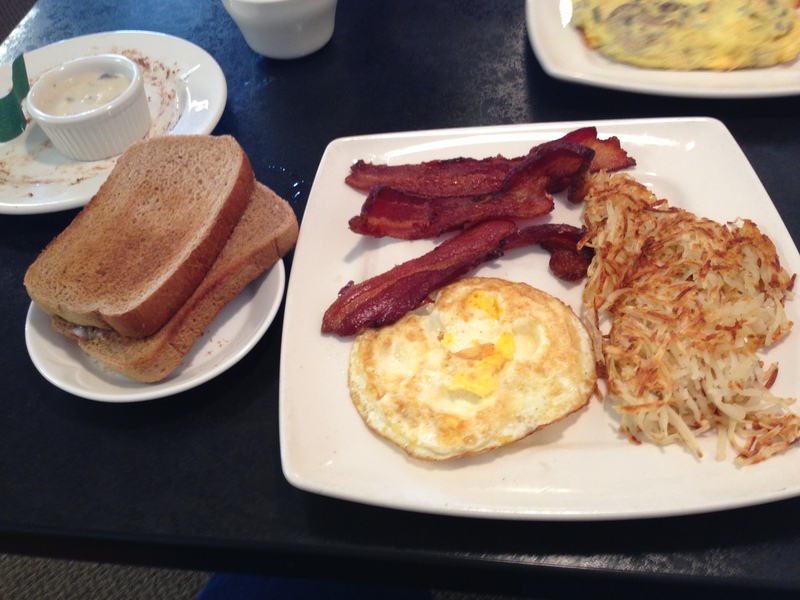 I generally don’t waste breakfast orders on just eggs and bacon but they boasted “thick-cut bacon cut especially for us.” The eggs were good, the toast with thick and perfect toasted, and the bacon was an exceptional stand-out! It was perfectly cooked, a good quarter-inch thick and had a great smoky flavor. My mom got a mushroom omelet that had a massive amount of mushrooms and cheese in it. It was huge for the price and the second half made a good left-over breakfast the next morning! Her omelet and my eggs/bacon both came with hash browns. I’ve had some really good hash browns at a place Paoli so these were nothing special but I did really like that they weren’t greasy. They were a good partner to the eggs. FOODNOTES: The decor definitely leaves something to be desired. The menu is exactly the same as the Fitchburg location so which one you go to depends on your location preference. If you go I suggest getting a cinnamon roll for the table to share because even though they aren’t as good as the original ones, they are at the top of my Madison cinnamon roll list. Ordering their special-cut bacon with anything you get is a must because it was especially tasty! Also, the prices were reasonable for the amount of food you get. 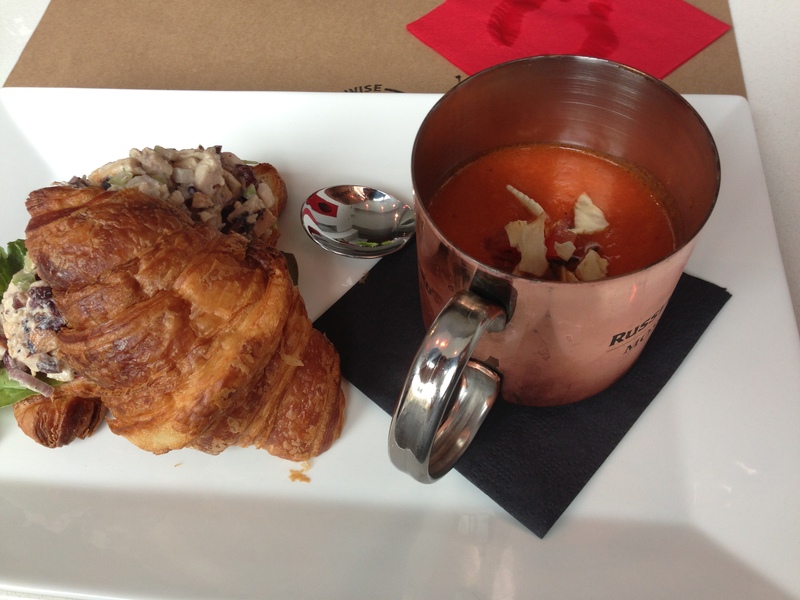 I have been going to Madison Magazine’s Restaurant Week for four years now and love the concept! It makes eating at nice restaurants a set price (usually cheaper) and some of the restaurants even make special menus for Restaurant Week. I’ve gone to a dozen or so restaurants during Restaurant Week that I regularly wouldn’t have been able to afford. Last year I squeezed in five dinners and had a blast! This year I’m doing two dinners and a lunch. 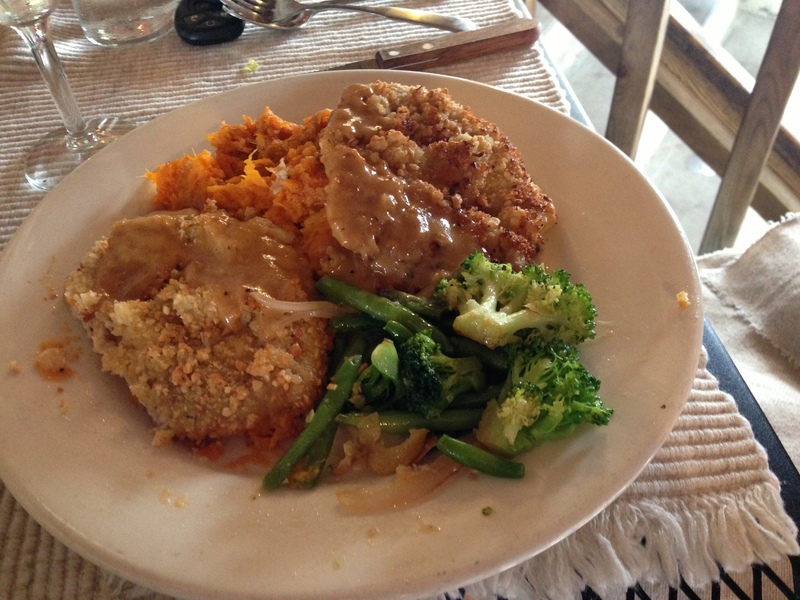 Yesterday was the first day of Restaurant Week, and I went to the Old Feed Mill in Mazomanie. The Mazo Old Feel Mill is actually in an old feed mill with beautiful wood floors, huge barn doors and massive antiques! I didn’t actually get to see the dining room because we sat outside on the patio under a huge metal-roof-covered patio! It was pouring rain and probably the best seat in the house. They made it seem like they were too busy to seat us outside but then let us sit out there anyways. I’m not sure if it actually was busy, the parking lot wasn’t full and less than a dozen tables walked in or out while we were eating, but the service was terrible. We barely saw our waitress, she had the bartender bring most of our food, and we had to ask multiple times to get water refills, a to-go box and even our desserts. Then after some awful service she felt the need to fight me on our bill and the manager had to come over to apologize. Everything on their Restaurant Week menu is also on their regular menu, which is good because it doesn’t disappear after Restaurant Week! There were two appetizers, stuffed mushrooms and fried artichoke hearts with dill dip. We got one of each and they were both very good. The mushrooms were a good size, and were stuffed with a lot of cheese and something spicy. It was the perfect amount of spice, and good ratio of mushroom to cheese. The artichoke hearts were lightly battered and the dill dip was a good accompaniment. We were both very happy with the appetizers. For entrees they were offering a chicken, pork or beef dish. I got the pot roast that came with mashed potatoes and veggies. 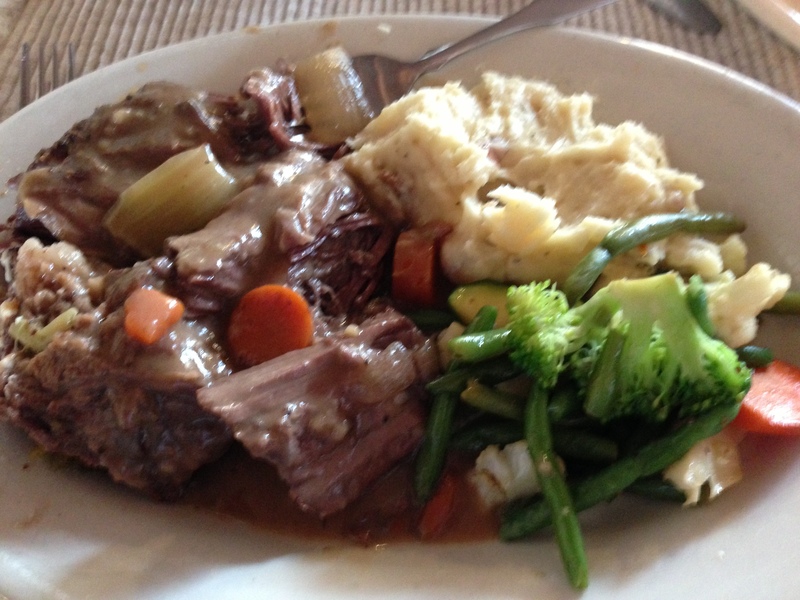 The mashed potatoes and veggies were nothing spectacular but the pot roast was flavorful and very tender. My mom got the cashew-crusted pork that came with veggies and mashed sweet potatoes. I don’t like cashews but the pork itself and the mashed sweet potatoes were good. My mom liked it all! For dessert I got the bread pudding and my mom got the berry cobbler (turned out to be blueberry). I’m allergic to coconut so was pretty sad to see coconut on my bread pudding when it arrived. So basically my mom got two desserts and thought they were fine. The tiny bit of the cobber I ate was alright. FOODNOTES: If the service had been better I would definitely say I’d go back but the service will probably deter me from going back. Especially since the quality of the food wasn’t extraordinary to make me forget the bad service. The appetizers were the best of the meal and then it slowly went downhill from there. I would only suggest going there if you are looking for a nice place in the Mazo area. If I ever go back to Mazomanie I will probably go to the old drive-in diner on the main road. It looks fun and a lot cheaper than the Old Feed Mill. I’ve lived in Madison for six years now and still haven’t found the perfect place for Chinese food. In college I ate Asian Kitchen because it was cheap, tasted decent and they delivered for free! But now that I live in Middleton and have a car, I don’t eat Asian Kitchen anymore. I’ve tried Tom’s Red Pepper in Middleton, which was fine but seemed a little too expensive. Where is your go-to place for Chinese food in Madison? I had been hearing a lot about HyVee’s Chinese food so before my shopping trip I decided to try it out. I got the two-entree meal that comes with rice or noodles, an egg roll or crab rangoon, and a fortune cookie. First off, I was excited that I could substitute lo mein for rice because I never eat the rice. The lo mein was probably the best part of the meal. It was flavorful and not too greasy. I also really liked the large chunks of cabbage in it. The egg roll was nice and crispy but the filling was a little lacking, which led me to dip it in spicy mustard. That was a good combo but I would prefer the egg roll to stand on its own. For my two entrees I got garlic chicken and Mongolian beef. I usually love mushrooms so the garlic chicken dish that was half mushrooms looked like a good choice. But I actually didn’t like the dish. The chicken was too mushy. The mushrooms had an odd, slightly canned flavor to them. And the sauce wad basically flavorless. The Mongolian beef, on the other hand, was very good. The beef was perfectly cooked with huge chunks of onion and green beans. The sauce was just a tad spicy and had a pretty good, hearty flavor. For $8 I got a huge portion and had to take half of the lo mein home, which is pretty comparable to Asian Kitchen’s prices. The biggest difference between Asian Kitchen and HyVee was that Asian Kitchen’s fortune cookies tasted like cardboard and HyVee’s had a vanilla-y flavor! FOODNOTES: Since The Mogolian beef and lo mein will definitely be on my plate again but I will probably opt for something else over the garlic chicken. HyVee is decently close to my job I will probably go back on dinner breaks when I’m craving Chinese food. It’s a very good alternative to ordering food for eight just to get three different dishes and having to eat it for a week. Where’s the best iced coffee? I got my nails done with a friend today and we went to Panera after to keep chatting. I’m usually not a fan out iced coffee (I am a coffee addict!) but it is so freaking hot today that I couldn’t even consider getting a regular coffee. In my opinion iced coffee tends to be bitter and not as smooth as regular coffee. After waiting a little too long for my iced coffee at Panera I was pleasantly surprised. 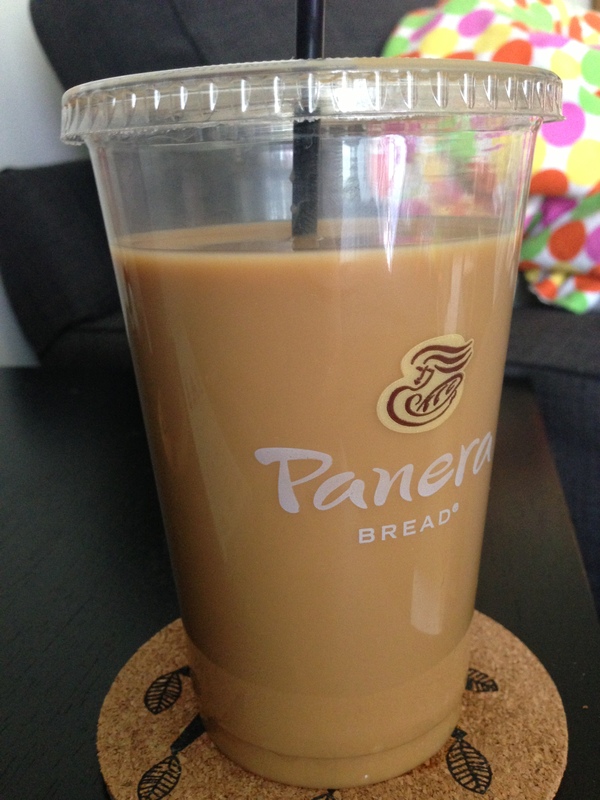 With some skin milk added, my iced coffee was very good, plus Panera has free refills! Do you like iced coffee? Where do you think they sell the best iced coffee? 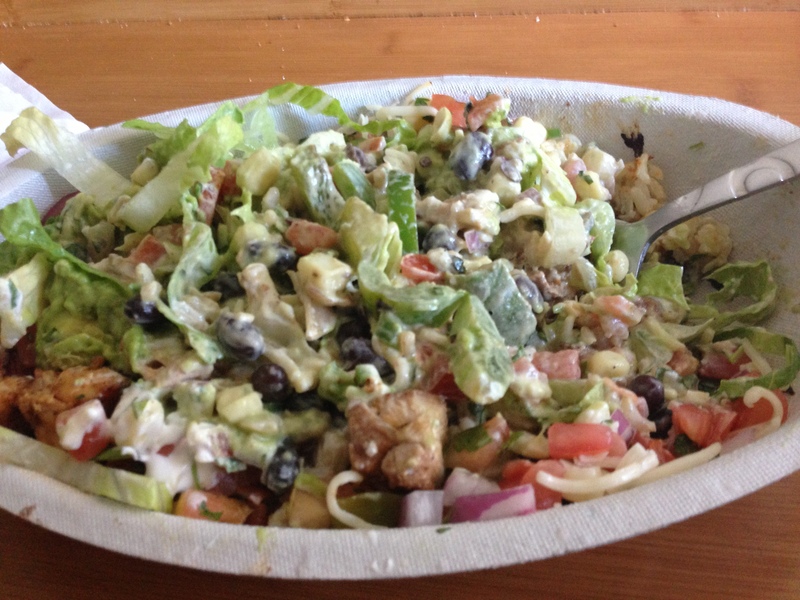 What is your perfect Chipotle burrito? My first Chipotle burrito was in college. I had no idea what to get so I got what my friend got. A chicken burrito with black beans, white rice, hot salsa, cheese and lettuce. It was good but I’ve fine-tuned my perfect burrito over the years (and now it’s not even a burrito! It’s a burrito bowl!). The best additions to my perfect Chipotle burrito was fajita and their new brown rice! I also put chicken, pico, corn salsa, cheese, sour cream, guacamole and lettuce in my burrito bowl! If I eat at Chipotle I put the green jalapeno Tabasco sauce on it for a kick!